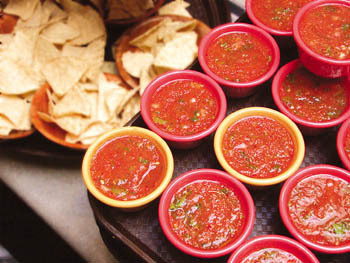 Math Can Be Delicious: If you have this many bowls of chips and this many bowls of salsa at El Palomar Taco Bar, how psyched are you? It's the tortillas. That's what I thought last week when Jack and Noah and I bellied up to the El Palomar Taco Bar and ordered a few hits from one of Santa Cruz' favorite menus. How can you possibly beat them? When El Palomar Restaurant first opened, their claim to fame was handmade, in-house corn tacos, soft and sensuous. So when the ingenious makeover of the arcade pass-through opened a few years later, it already had an advantage. The small, fragrant corn tortillas are little New World poems, and even the larger flour tortillas are sensational. Supple and tender, they reinvent the concept of flat bread. So we got behind a conga line of babies in those high-tech Bradley fighting strollers, lawyers in Ray-Bans and the usual assortment of downtown professional types. The ballgame was on the TV, beaming over the narrow hall of counters and tables reflected in giant mirrors. The huge starburst wall plaque reminds me of Puerto Vallarta. So does the blaring salsa music. Like all taquerias, El Palomar Taco Bar is already loud, so who cares if the babies get down and let loose? Why are we all here, watching a team of women very quickly assembling colorful plates of food? Three words: good and cheap. Consider a layering of two impossibly tender corn tortillas frosted with refried beans, piled with morsels of succulent fresh snapper in tomatillo salsa, salsa fresca and a lavish amount of tomatoes and shredded cabbage. Hold that thought. And now attach a $3 price tag. Yes, it is amazing. And El Palomar Taco Bar can deliver its payload in prawns, or chicken, or sensational guacamole, or scallops or rich carne asada. Three dollars. For a few dollars more, you and your significant other can attempt to finish a giant burrito ($6). Which is exactly what Noah tried to do. Prawns literally spilled out of the enormous flour tortilla as Noah attempted to wrestle a sierra madre of beans, salsa, prawns and rice into submission. The burrito won. Maybe he filled up too much on the basket of chips and the addictive salsa we ate while waiting for our order. The taco bar superstar is the wonderful snapper taco (the fave of my dentist William Christie, who has a serious El Palomar habit) with its firecracker topping of seafood, serrano-laced salsa and shredded cabbage ($3). But I also fell in love with the generously proportioned prawn version (also $3), which was almost too large for one woman to consume. Do not wear your silk blouse! But the diet Coke helped get me through. Jack was whispering "bueno" over and over like an overburned CD as he offered me a bite of his combo lunch. Five dollars in this case gets you a guacamole taco--voluptuous guacamole, the kind you try to make at home and yet you simply cannot make at home. Plus, a quesadilla topped with a dollop of sour cream, a small pool of amazing tomatillo salsa and a giant dollop of more guacamole. There was no denying it. The combo ruled. My body was doing that little swaying food dance of sheer pleasure. And not simply because the guacamole was so damn good. The quesadilla was also on target. Thin, wide and elegant--not fat and bumpy. Filled with a thin melted layer of cheese, it lent itself easily, effortlessly to the sour cream and to the guacamole. Every great flavor of the Mexican taqueria experience was happening here--plus this is a vegetarian dish. The guacadilla combo is the star. Can it get any better than this? Can it really? Fresh abundant calories and not a trace of fried food. Yes, it is great to be an American. Cuisine: *** Short and sweet, made-to-order tacos and burritos filled with zesty fresh taqueria classics. Way inexpensive. Overall: A terrific idea from the moment it opened, this taco bar has got its act together.